We all know those first days back to school after summer break can be overwhelming. That is why the following resource will make that time a bit easier. This is a computation of some of my best back to school resources for middle school. There are 9 different activities to choose from. Use one or all to help make the transition a smoother process. This resource is one of my best sellers for back to school. Don't miss out on the fun. Get yours today! Click the picture to preview this great back to school resource! 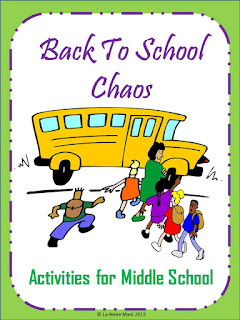 Remember Back To School Chaos can make your life much easier. Click the picture above and find out for yourself. Connect with me for more Great Teaching Tips!